Windows operating system, the most popular Microsoft product ever created, has never been offered free to consumers. But facing the heat from the Internet and Mobile wave, where most of the awesome services are free, Microsoft is now ready to play it’s ultimate gamble: Offer Free Windows 8.1 for users! Sources have reported that Microsoft is toying with an idea of this free operating system to boost its usage and adaption among the more Internet savvy generation. Code named “Windows 8.1 With Bing”, this will bundle most of the popular Microsoft owned products and services (example being Bing, Skype, OneDrive, Office etc) into one and offer as a free download for anyone. 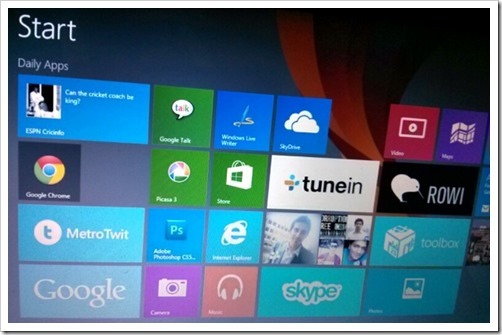 Here are some leaked images from this version of Windows 8.1 which can be reality as well. It is being speculated that Microsoft will use Chromebooks type monetization method for “Windows 8.1 with Bing” offer. The company plans to recover it’s software licensing costs by monetizing the usage of these free applications: more the number of users, more monetization methods will crop up. For example, as Bing starts receiving more users and more searches, it can hike it’s CPC or Cost Per Click rates. Similarly, more free Skype or OneDrive users can hopefully be converted into paid users of these services. It would be a huge shift for Microsoft, which has been traditionally into license based monetization method. In fact, the huge popularity and demand for Android based mobile units may have prompted Microsoft to go for this route. Last year in December, there were reports that Microsoft may offer free or low cost Windows OS for mobile users, as a strategy to counter Android popularity. Then there was this huge rumor that Microsoft will cut Windows 8.1 licensing price by more than 70% for low cost PC vendors. Something phenomenal is surely brewing up inside Microsoft’s management team, and hopefully, it will bring some good news for all! Disclaimer: Microsoft hasn’t yet confirmed about this Free Windows 8.1 bundle offer, and this may never hit the market as well. But some of the leading technology news sources have reported this possibility, and there is a huge buzz going on regarding this shift in strategy by Microsoft. We will keep you updated.